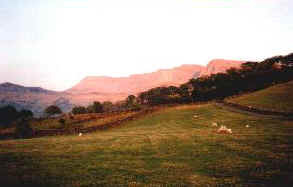 Cader Idris marks the southern most limit of Snowdonia's mountains. This route completes a circular ridge walk of Cwm Cau and takes in its most interesting features. Haunting views only confirm the saying that a night alone on Pen y Gader will either make you a poet or a madman! The route goes up the Minffordd path from the South East side and takes in the 3 major summits of Mynydd Pencoed (798m), Pen y Gadair (893m) and Mynydd Moel (855m). From the Idris Gates follow the avenue of trees to a footbridge and further on a gate. Ascend the zig-zagging path through the woods to level ground and then ascend along the main path to circle into Cwn Cau. At a large cairn climb up to the left to the top of the ridge - follow this ridge to the summit of Mynydd Pencoed and on to Pen y Gadair and Mynydd Moel. Carry on east from Mynnydd Moel a little way before heading south east down a broad grass shoulder ... by keeping close to the fence the path improves until it leads the a break in the wall to rejoin the approach path just above a pine plantation.